C-J estimates a 67.6% chance the fourth quarter will be positive. The simulation results suggest a 62.2% chance the market will end the year above the September record high of 2940.91. On the negative side, C-J estimates a 4.6% chance the market will end the year down 10% or more from the September close. After finishing 2017 at 2673.61, the S&P 500 advanced 240.37, or 8.99%, over the first nine months of the year to end the third quarter at 2913.98. The third quarter was particularly strong, one of the strongest quarters in years, as the S&P 500 advanced 7.2% during the quarter alone. Back in early July, I published a second half outlook article for 2018 using the C-J simulation results. Those results estimated the probability of a 5 to 9.9% gain for the Index in the third quarter at 24.9%. Furthermore, at that time the median simulation called for the S&P 500 to end the year at 2863.79. Back in July, C-J also estimated a 28.1% chance the S&P 500 would end 2018 above 3000. Given the pace of recent movements in the market, and a positive (albeit risky) outlook for October (see my October article), the Index now appears to be moving up higher than expected. Now with that said there are plenty of market experts, both here on Seeking Alpha and on other sources, forecasting either new record highs, corrections, or bear markets before year end. And there are so many diverse opinions about what will cause the market to move, either positively or negatively, through the remainder of the year including Federal Reserve policy, earnings, trade wars, geopolitical risk, market technicals, or even the upcoming mid-term elections. So as I began writing this article, I decided to follow my previous approach and frame the C-J results as the answer to three of the questions I find most interesting. What are the likely changes in the S&P 500 in the fourth quarter of 2018? How likely are we to remain above the recent intraday record high of 2940.91? What about 3000? At the beginning of 2018 so many analysts were calling for the S&P 500 to end 2018 at 3000 or above. How likely is that result? The results of the simulations show the associated probabilities of various outcomes from C-J’s fourth quarter simulations. 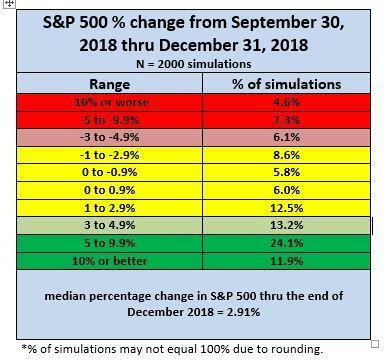 The median simulation calls for an increase in the S&P 500 Index of 2.91% and C-J estimates a 67.6% probability the year will end above the September close of 2913.98. I take that as good news. But of particular interest to some readers may be the fact that C-J now estimates a 4.6% chance the fourth quarter will end with the Index down 10% or more from the September close. The worst case scenario from the 2000 simulations calls for a decline of 25.6% in the final three months, with slightly less than one half of 1 percent calling for the market to be down by 20 percent or more from the September close. Interestingly enough, although not shown in the table above, in only a handful of the simulations did the valuation become excessive to the point it resulted in the market declining. Given all the talk about an impending bear market or correction, C-J clearly does not see valuation as the driver of that result. In response to my second question, C-J estimates a 62.15% chance the market will end the year above the recent high of 2940.91 set on September 21. And finally, if you are curious about the market ending the year above 3000, C-J now estimates that probability at 49.4%. Given recent trends in earnings and the market, that probability is now significantly higher than the estimated probability of a year end 3000 level made back in July (28.1%). To readers: I usually publish the results from C-J once a month. At the beginning of January, April, July, and October, I write an additional article examining the simulations through year end. If you would like to read more of C-J’s simulation results in the future, please click on the follow button at the top of this article next to my name.